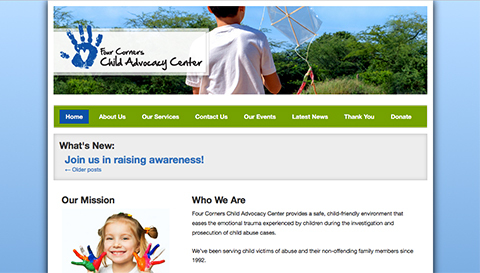 Cortez Web Services worked with the Four Corners Child Advocacy Center in Cortez, Colorado to redesign their existing DIY template website. Their new website has lots of information about the Child Advocacy Center and showcases the different services and programs they offer. The redesigned website features a dashboard with a more user-friendly interface for managing content updates, with the creation of custom post types for posting announcements and upcoming events, and thanking recent donors.